We will look at two possible methods used when subtracting fractions from a whole number. We convert the whole number to a mixed number and then perform the addition or subtraction. The following video shows how to subtract fractions from a whole number. Step 1: Borrow 1 from the whole number portion. 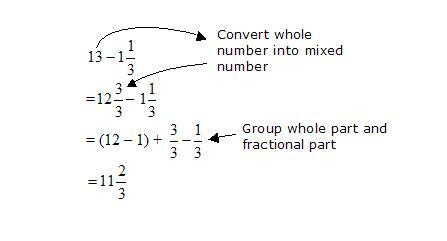 Step 2: Convert 1 into an equivalent fraction with same denominator to the given fraction. 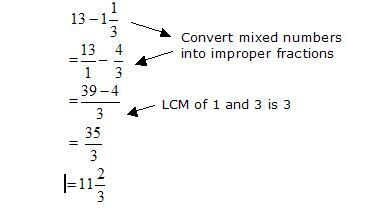 Step 3: Subtract the given fraction from the equivalent fraction you converted. Step 4: Add result from step 1 and step 3. We convert the whole number to a fraction with the same denominator as the fraction and then perform the addition or subtraction.